Hi everyone! After sharing my finished oven mitt and matching pot holder I made using Bake Sale fabric and some trusty Pam Kitty Love the other day I received a message from one of my blog readers saying she wanted to re-create a pot holder for herself, so I'm here today to give you a tutorial so you can all make one! :) It uses the Ohio Star block pattern for the top and measures 8" square, a perfect size to hold a range of saucepan's or just look pretty in your kitchen! (which is what mine will be used for as I didn't have any Insul-bright for the inside!). 2. Cut each of your 4" squares in half, corner to corner. Repeat on the other diagonal so you have 16 quarter square triangle units. 3. Begin sewing your unit's together (along the shorter side of the triangle). Alternate the fabric print (e.g. sew 8 pink cherries on the left, then sew the 8 units with the pink cherries to the right). 5. Once you have your 4 quarter square triangle units sewn together, lay your block out as shown below (well, not quite - please note the incorrect unit placement on the bottom! This should be turned to the side, as the top one is). 6. Sew your units to make 3 rows. Then sew your rows together to create your Ohio Star block. 7. Lay your backing fabric face down, then Insul-bright wadding with the pot holder top, face up - and pin in place using quilter's curved safety pins. 8. Quilt your pot holder top as desired. I machine quilted mine with a walking foot. Square up your block and trim excess. 9. For the hanging loop, just make this as you would for regular binding, then fold it again in half lengthways and sew down the edge. Pin to the corner of the backing fabric. 10. Pin your binding in place and sew. (If you're unsure about binding there's plenty of help on the web, or try Jeni B's tutorial here). 11. Fold over and pin the binding in place to the back of the pot holder (your hanging loop should now be visible). I like to hand sew all of my binding's as it doesn't take very long and, personally I like the look of it much better to machine sewing. So cute! I love it!. Thanks so much for sharing a tutorial! Really very nice potholders!!! So sweet and summery :) J. These are just beautiful <3 Thank you so much for the tute! I love it. Thank you for the tuto! Such pretty pot holders. Thanks for the tutorial. Love them!! I want to make some too!! 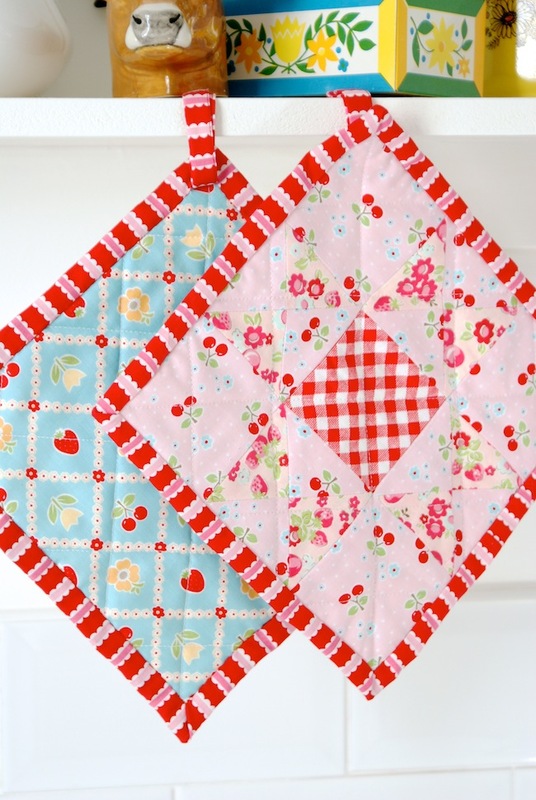 These are so lovely - thanks for the tutorial, going to bookmark it and add it to me "really-would-love-to-make" List! Very pretty - almost too pretty to use!! i love your ad on the inside cover of "quilting and patchwork" mag ! it is delicious . you should get lots of orders from that..
Great tutorial!! They are adorable.